It's time to close the competition to guess my favourite Narnia character. The answer is - Reepicheep! 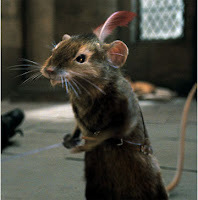 Reepicheep is decended from the mice who helped cut Aslan's bonds at the stone table. In gratitude for this, Aslan turned them into talking mice. At the end of Voyage of the Dawn Treader, he reaches the end of the world and enters Aslan's country. He welcomes the children to Aslan's country in The Last Battle. people aren't very original in their response when they meet him. "You're a mouse!" = "Kamal - do you sing?" Reepicheep has a fan list (yes, I'm a fan), and a little youtube tribute (no, I didn't do that - not technically competent enough). So, who won the competition? Congratulations to Mark Barry, who picked it immediately. I'm still thinking about the funniest explanation. Shall get back to you on that. Funniest explanation = your mum's! Don't forget the Narnia character! God’s mission 2: what is God’s mission? Who's my favourite Narnia character?